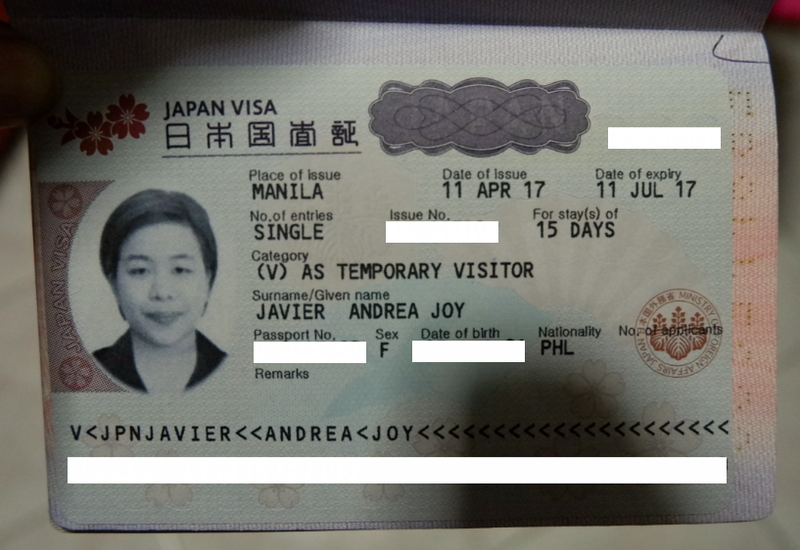 One look at the requirements for Japan visa and you’ll start to think twice about going. 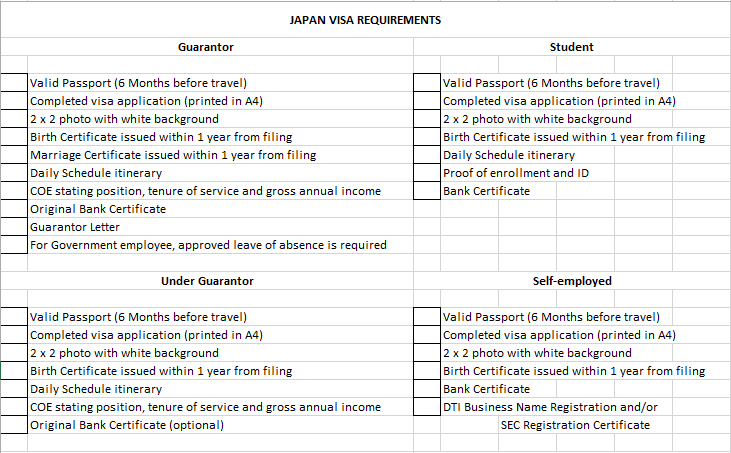 But do not get too overwhelmed with the requirements, it’s actually pretty easy to apply for a Japan visa. For our visa, we went to Rajah Travel Corporation. I have a friend working there and she advised me to wait for the Travel Expo to pay for the visa processing fee because they will give a discounted amount. So we went to the Expo last February and pay for the visa processing fee of P450 instead of the original price of P1,500. Then, they sent the list of requirements for the visa. Valid Passport. It must be valid 6 months from the date of travel. Bring old passports. Completed visa application form. Your agency will give you this. Or you can download it here. For those with guarantors (example, mother will shoulder the expense of the kids), a separate form needs to be filled. You can download it here. Original NSO Birth Certificate. Must be issued 1 year from filing. You can order it here for P350. If married, NSO-issued marriage certificate. Certificate of employment stating position, tenure of service and with gross annual income. You can also include your ITR or anything that will prove your employment. Original bank certificate. Must be issued within 3 months from filing. 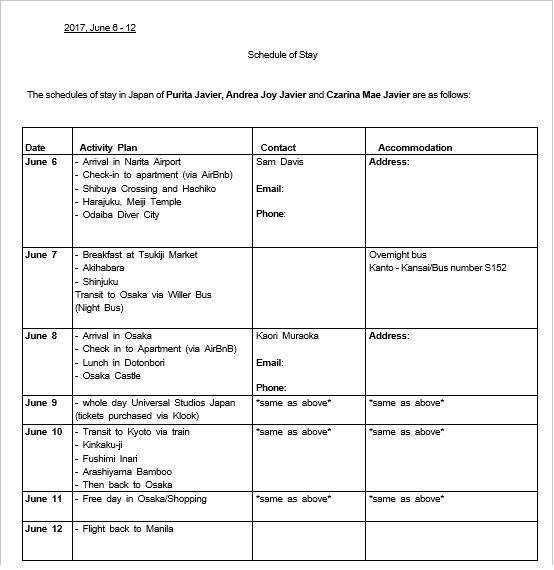 Daily schedule/itinerary in Japan. Here’s our daily itinerary. You can use it as a sample. * It doesn’t have to be super detailed. Just give them an idea where you’ll be going during your stay. I personally believe the itinerary will be considered when they check your bank certificate. We were a group of 6 where 1 was a guarantor, 2 were under the guarantor, 2 students w/o guarantor and 1 self employed. Since I think better when I create lists, I came up with this checklist. Please see the requirements below based on which category you fall in. * Feel free to copy my checklist or comment below/send me a message, I can send you the template. Once you submit everything, the agency personnel will go through your documents and make sure you have complete requirements. Afterwards, just wait and pray that you’ll get approved. Usual turnaround time is 3 – 5 business days. Hello! For the students without guarantor, whose bank certificate did they use? Hi Gerard, they used their own. One of them has a joint account with her mother, the other one has her own bank account. since it is only a bank cert, it wouldn’t show the transactions, so you can have your parents deposit a few amount in your account to make sure you have enough.